In recent years there has been intense interest from Asian markets in Australia’s food, vitamins and more recently our milk formula is being snapped up like it’s the nectar of the gods. 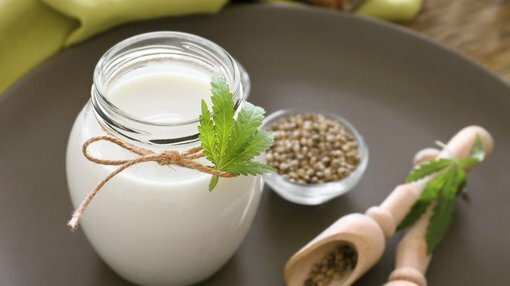 Among health and well-being stocks there have been takeovers of mid-cap players, broker speculation about a potential takeover of our $2.2 billion market leading Blackmores Ltd (ASX:BKL) and even criminal activity in relation to stockpiling, smuggling and exportation of our milk formula to China. On the corporate front, in late 2016 a Chinese consortium which included a subsidiary of Shanghai Pharmaceuticals Holdings and PV Zeus Ltd, a subsidiary of Primavera Capital Fund II L.P. acquired ASX-listed Vitaco Holdings Ltd for approximately $300 million. While the offer price only represented a marginal premium to the IPO price, the distributor of sports nutrition products and body-building protein powders under brands such as Nutra-Life, Wagner and Healtheries had been listed on the ASX less than 12 months. The acquisition reaffirmed a trend which has only strengthened in recent years — the appetite for Australian health and well-being products that are clean, green and trusted is unquenchable. Consequently, companies operating in that industry are likely to come under the microscope. The criminal market manipulation and smuggling of milk formula has grabbed the headlines recently with organised raids on supermarkets snaring the formula in order to sell it into premium paying Asian markets. However, investors can legally get a slice of the market by buying into ASX listed stocks that are focused on the health and well-being sector, companies that could well be the subject of premium takeover offers, particularly while their share prices are recovering from the market volatility that occurred in the last three months of 2018. We have three health and well-being focussed stocks today, each of which have market capitalisations of less than $100 million, making them prime targets, particularly given that they are emerging players with compelling products. 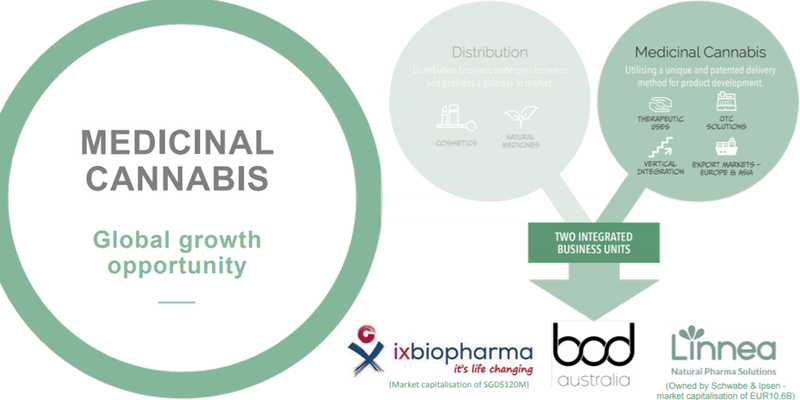 On the score of sought after product profiles, the smallest of the three, Bod Australia Ltd (ASX:BDA) also provides leverage to the burgeoning medical cannabis market. It has a market capitalisation of $34 million, but this is on the rise with its share price having increased more than 20% in January on the back of promising news, including record revenue growth in the December quarter. 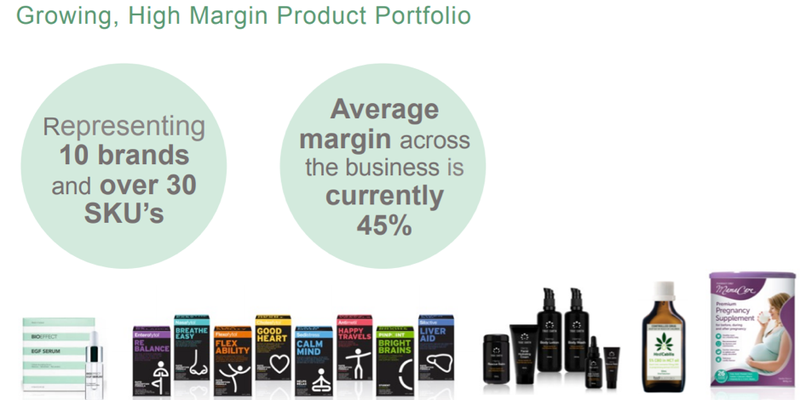 Bod’s products are pitched at the five fastest growing and most lucrative segments in the pharmacy channel, including healthy ageing, women’s health, digestive health, daily well-being and healthy immune system health. The 2017-18 period was a transitional stage in Bod’s expansion as it progressed a number of initiatives to significantly broaden its distribution footprint, scale its revenue profile, formalise agreements with international enterprises, bolster the company’s product offering and work towards the commencement of the Phase I Clinical Trial of its sublingual cannabis wafer. Success with the latter will leave Bod with a globally unique product which can be distributed internationally or licensed to large scale pharmaceutical companies. The company has a strong track record when it comes to securing agreements with major pharmaceutical groups. Bod has distribution agreements with two of Australia’s largest pharmacy wholesalers in Australian Pharmaceutical Industries (ASX:API) and Symbion, providing the company with access to over two thirds of the Australian pharmacy market. 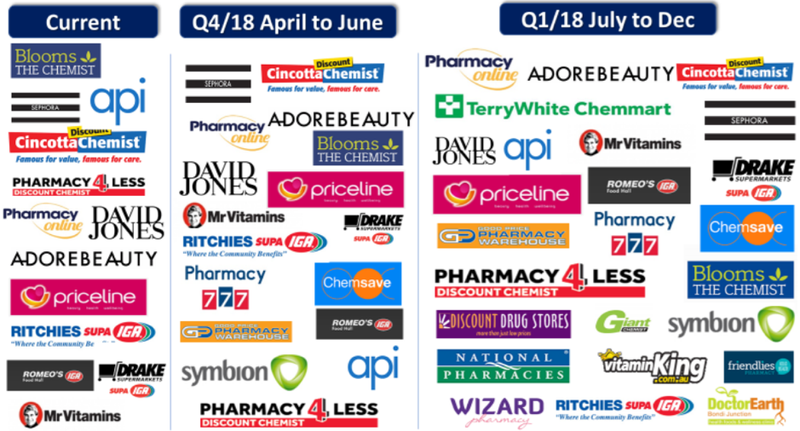 API is one of Australia’s largest wholesalers, distributing to more than 2,000 pharmacies across its network which includes some of the best-known pharmacy chains in Australia. Pharmacy chains under the API banner include Priceline, Chemsave and Pharmacy 4 Less. API and Symbion stock Bod’s entire range of natural medicines and premium pregnancy supplement, MamaCare. These agreements have allowed the company to better utilise working capital, secure superior market positioning and centralise logistics management. This added distribution has also underpinned revenue growth, a factor that is extremely evident in the group’s recently released December quarter figures. During the quarter, Bod achieved record revenues of $1.2 million comprising sales of $766,000 — a 260% increase on the previous corresponding period. Revenue generated also included a research and development grant of approximately $450,000 which recouped costs associated with Bod’s Phase I Clinical trial of its proprietary sublingual cannabis wafer. To put the group’s December quarter performance into perspective, this implied annualised group sales of $3 million, compared with approximately $1.1 million in the 12 months to June 30, 2018. Highlighting the traction it’s gaining from pharmacy agreements, Bod Australia chief executive Jo Patterson said, “Considerable sales growth is the result of multiple distribution arrangements, including the agreement secured with Priceline Pharmacy to stock the MamaCare pregnancy supplement in a minimum of 200 stores, coming into fruition. MamaCare is specially formulated to meet the increased nutritional demands of women planning a pregnancy, are already pregnant and breastfeeding mothers by providing essential protein, vitamins and nutrients which are beneficial to a mother and her growing baby such as Folic Acid, Iodine, Iron, Protein, Vitamin D and Calcium. In November, Bod strengthened its position in the medicinal cannabis industry by gaining an export listing on the Australian Register of Therapeutic Goods for its patented sublingual form of medicinal cannabis. The licence provides Bod with the ability to export medicinal cannabis products manufactured in Australia, into international markets. Initially, Bod will focus on exporting its sublingual cannabis wafer product to European countries including Belgium, Switzerland and the UK. The company continues to build a considerable presence throughout Europe and will leverage its relationships with key partners, such as Linnea SA (a subsidiary of Schwabe and Ipsen) to drive sales. Bod is also progressing opportunities in Asian markets, which it will aim to advance as regulation permits. In Australia, Bod achieved a significant milestone in aligning with Australia’s largest pharmacy retailer, Chemist Warehouse Group to distribute MediCabilisTM, Bod’s pharmaceutical grade cannabis extract (Ecs315), in oil form. This is an important development as Chemist Warehouse has more than 450 stores. Bod management recently confirmed that a number of prescriptions for the product have already been received, contributing to December quarter revenues. The company has also been successful on the research front, achieving a major milestone with the Phase I Clinical Trial of its proprietary CBD extract ECs315 suspended in a sublingual wafer delivery method. This is the first time that the pharmacokinetics, or the interaction of a drug and its absorption, distribution, metabolism and excretion, of a full plant cannabis extract have been evaluated under ‘blinded’ clinical trial conditions. Blinded conditions provide much greater credibility as they are based on the patient and clinician not knowing if they are using an active drug or a placebo. The next phase of the trial tests the absorption rate of Bod’s patented sublingual wafer compared to the ECs315 cannabis extract currently available in oil form. Bod is also testing the absorption rate against a competitor’s product, which is currently available on the Australian market. Phase I Clinical Trials are well progressed and management expects results to be reported during the current quarter, a potential share price catalyst. The pending announcement of this news could account for the strong buying that occurred in January which saw its shares increased from 39 cents to a high of 52 cents when the December quarter report was released. Bod is increasingly being viewed as a company that can successfully manage its supply chain by developing, marketing and distributing its products. With a similarly attractive vertically integrated model to that of Vitaco prior to its takeover, Bod could potentially have suitors knocking on its door, particularly as it penetrates the medicinal cannabis market where merger and acquisition activity is rampant. Promising newsflow from Eagle Health Holdings Ltd (ASX:EHH) saw it emerge as the best performing stock (with a market cap between $50 million and $500 million) in the week ending February 1, 2019, with a 40% gain. Not only did Eagle Health provide its shareholders with a 40% gain last week, the company’s gained 100% in less than three weeks when it touched 30 cents on January 31. There have been a number of factors driving the company’s shares higher. One of the most prominent is the launch of its brand, Zhang Lao San, a new health patch product developed by Eagle Health with traditional Chinese medicine ingredients, designed to help with joint pain relief. Eagle Health will integrate the new brand into its group and operate on the model of “100 stores, online and WeChat” to sell health and nutritional products from Australia and China. This model will allow the company to build on its strong presence in the health products market in China and continue to drive sustainable growth in the business. While this is an important product for Eagle Health, from an investment perspective it is vital to understand the company’s broader business model as this, like other successful medicinal product development groups, incorporates a vertically integrated end to end product development to distribution operation with optimum supply chain management and access to mass markets. This model assisted the company in delivering strong revenue and gross profit growth in the six months to June 30, 2018. The challenges faced by companies exporting into China have been well documented in recent years with the Chinese government able to impose import restrictions with the stroke of a pen. As this can have an immediate impact on revenues generated from that market, the share price falls for companies totally reliant on servicing that region have been substantial. Eagle Health benefits from having a certified manufacturing facility and a Head Office in Xiamen, China, acting as a central hub for distribution into Chinese pharmacies, health food stores, trading companies and supermarkets. The company develops, manufactures and distributes products into 26 provinces in China. Eagle Health is also collaborating with Chinese pharmaceutical groups that have large distribution networks in the country. In November, the company signed two separate cooperation agreements with Luyan Pharmaceuticals and Lianfutang Pharmaceuticals. Xiamen Luyan Pharmaceutical Co. Ltd (Shenzhen Stock Exchange:002788) is a pharmaceutical group that produces and manages health products. Luyan Medicine is one of the top 500 service companies in China, in the top 50 Chinese pharmaceutical distribution company, and one of the top 100 enterprises in Fujian Province where it has 144 direct retail outlets in Jiuda Province. Management will leverage these new relationships to accelerate sales growth in the local Chinese market, while expanding its network to effectively promote the achievement of sales performance targets. The signing of these two contracts represented another milestone of Eagle Health’s pharmaceutical distribution strategy of ongoing geographic expansion and market penetration. At the same time, with the expansion and coverage of the sales network, these relationships will assist the company in reaching its overarching strategic plan of launching 100 stores in the next 18 months to reach proximately 570 million consumers. With rising healthcare consciousness and a comparatively high rate of self-medication among Chinese when compared to other countries, the consumer health market has had robust growth over the last five years. 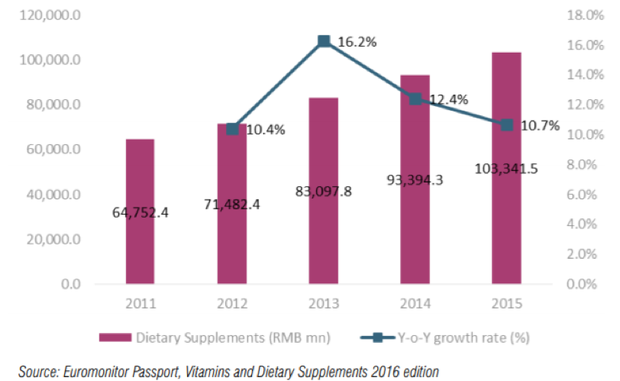 As indicated below, the dietary supplements market by retail sales value in mainland China has been experiencing strong growth. 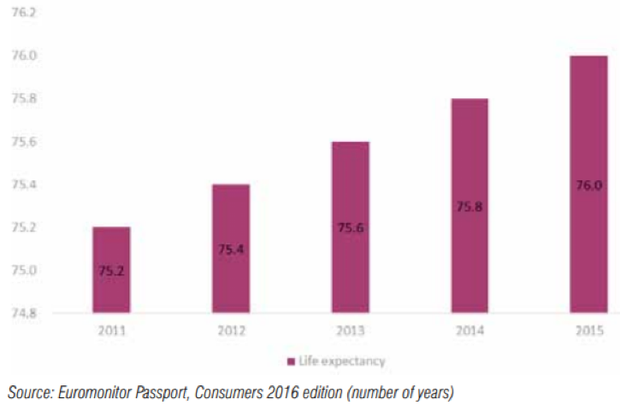 A substantial increase in life expectancy rates (see below), as well as a marked increase in middle-class consumers where there is the disposable income capacity to purchase healthcare products should sustain this upward trend in the usage of health and well-being products. Not only has Eagle Health delivered on the operational front, but its financial results for the six months to June 30, 2018 represented a strong performance. The following demonstrates double-digit growth in both revenues and profit, while also achieving a robust earnings before interest and tax margin of 17%. The following indicates the company’s impressive growth trajectory over the last two halves. It is important to note that the decline in margins over the last two halves is attributable to the non-recurring impact of IPO costs. It is a good sign that the company is growing revenue and earnings at strong levels while it is still absorbing the costs and often challenging teething problems that are associated with research and development, as well as the integration of new businesses and product launches. The company is also in a strong financial position with cash of $37.3 million as at June 30, 2018. A potential near-term share price catalyst is the February release of its full-year result for the 12 months to December 31, 2018. Investors who would prefer to target a more established company in this space could examine Vita Life Sciences (ASX:VLS), a group that is involved in the formulation, packaging, sales and distribution of vitamins and supplements in Australia and overseas. 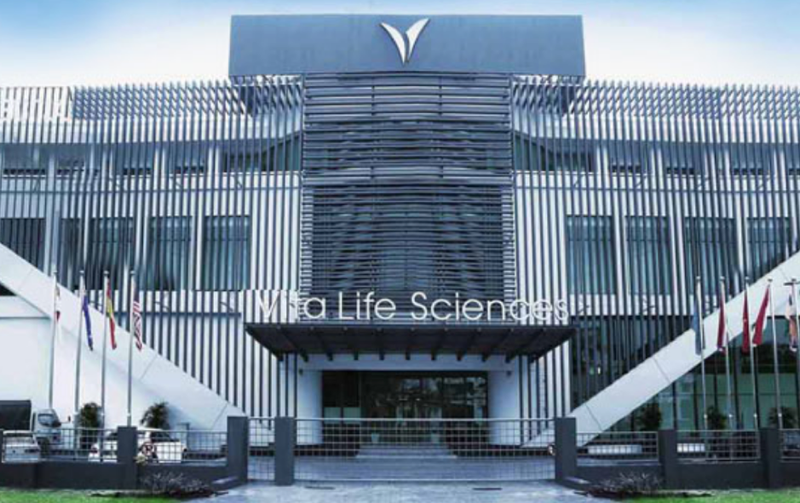 Vita Life’s core business is the development and distribution of over the counter (OTC) medicines, as well as complementary and alternative medicines, dietary supplements and health foods under various brand names throughout Australia, Malaysia, Singapore, Thailand, Vietnam, China and Indonesia. The company has been a model of consistency over the last decade, delivering revenue growth every year prior to a flat result for the 12 months to December 31, 2017. Further, every year since 2010 the company has been earnings positive and paid a dividend each year — an achievement that isn’t reflected in its relatively modest market capitalisation of $52 million. VitaHealth first started in 1947 as a retail pharmacy. The company launched its own brand of high-quality vitamins and supplements with flagship products, such as Supa Formula 3 and Crowning Glory. VitaHealth has more than 2,500 registered products, sold in pharmacies throughout Malaysia, China, Thailand, Vietnam, Singapore and Indonesia. Herbs of Gold is an Australian brand that was founded in 1989. By utilising traditional evidence combined with the latest research, Herbs of Gold produces premium herbal, mineral, vitamin and superfood products. Products that come under this brand are distributed through health food stores in Australia, and are also sold in Malaysia, China and Singapore. From a corporate perspective, the company is just completing year one of a three-year expansion program which should accelerate growth across its various business units and regions. This has to some degree impacted revenues and costs, but the company has still provided robust income and earnings guidance for fiscal 2018. Importantly, management has started to see the signs of improvement, but the full impact is likely to be more evident over the next 12 months to two years. The encouraging signs are that management has a history of under-promising and outperforming, are perhaps an indication that its initiatives will begin to gain traction in the near term. In the interim, the company’s business continues to perform efficiently with cash conversion to EBITDA of 100%. The Malaysian business grew strongly in the six months to June 30, 2018 with revenue up 21% compared with the previous corresponding period, assisted by increased advertising and promotional investment with major pharmaceutical customers. Management is forecasting revenues in a range between $41 million and $42 million for the 12 months to December 31, 2018, providing the basis for earnings before interest and tax in a range between $4.5 million and $5 million.